Continuity mistake: After the failed accident, you can see Lola's bra revealed on the right side. After a cut, the shirt covers it. 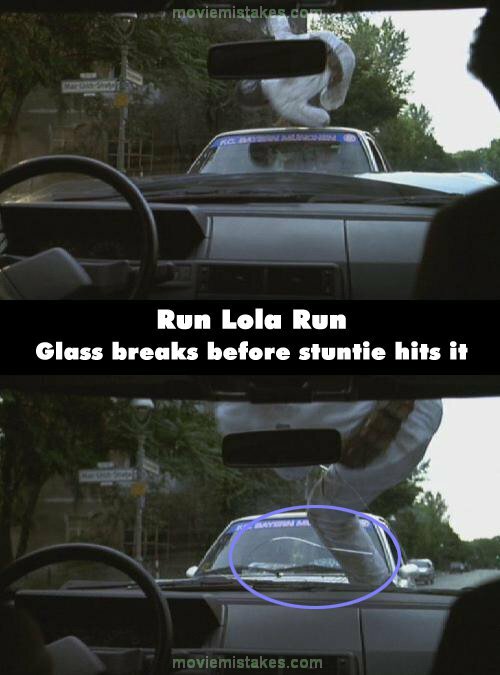 Continuity mistake: You can see that Lola's bra is moving on her shoulders from shots to shots during the whole film. Best visible at the scene where she threatens her father with the gun or when she sees Manni getting killed by the car. Continuity mistake: In the bank robbery scene, while Lola is escorting her father at gunpoint into the front room of the bank, she shoots out the code pad to open the door. The slide on the pistol locks to the rear as if it ran out of ammunition or jammed, however in the next cut the slide is forward again. 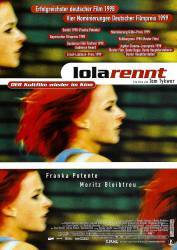 Continuity mistake: At the end of the first scenario, Manni and Lola are surrounded by police cars. They stand and look at them for a while, whilst turning around. The position of both of Lola's bra straps change from shot to shot. This also happens in other scenes in the film. Manni: What if I were in a coma, and the doc says, "One more day?" Lola: I'd throw you into the ocean... Shock therapy. The blind woman is played by Monika Bleibtreu, Mannie's (Moritz Bleibtreu's) real mother.